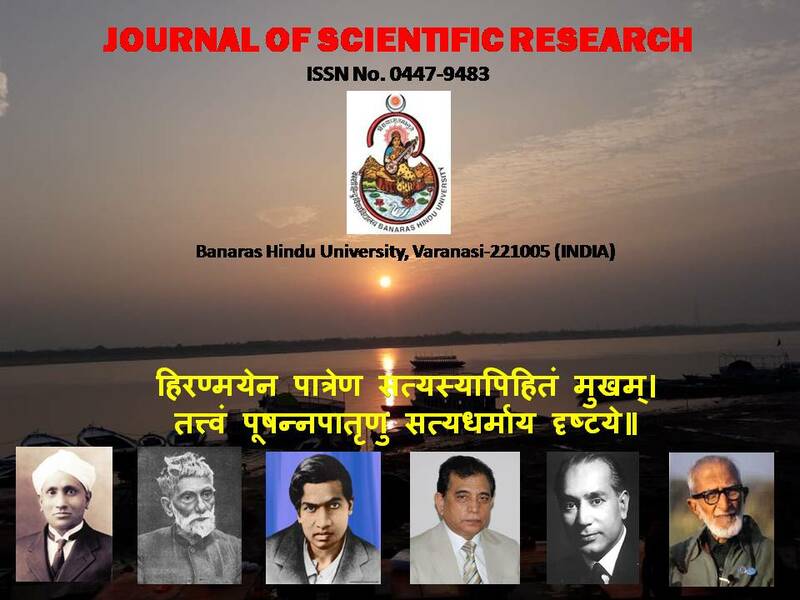 The journal of scientific research publishes articles and short notes from all branches of science. The contributions of interdisciplinary nature are highly encouraged for soliciting a wide spectrum readership of our journal. Name Deptt./School E-Mail Mobile No. 1. Original contributions of fundamental/applied research in all branches of science (emphasis on the quality and originality of the work). 2. Articles and notes (must be original with respect to concept, content (3000)Page size. (2000 words and writing). 3. During the manuscript submission, the author is required to furnish the names and e-mail addresses of at least five researchers qualified to act as reviewers. An editor will consider, but will not always follow the recommendations of the reviewers. 4. Authors are required to acknowledge/report all funding sources and grant/award numbers relevant to this manuscript. Coverage in abstracting/indexing services: Request has been sent to the following abstracting/indexing services: Indian Sc. Abstr./Chem. Abstr./BIOBASE/Biol. Abstr./Sci. Cit. Ind. Fresh manuscript must be accompanied by a signed letter of approval from research supervisor/head of department. Manuscripts without the necessary approval will be summarily rejected. Contributors are advised to submit their manuscript as electronic files. The storage medium acceptable is only compact disc (CD) in Windows format. The software for text is MS Word for Windows version 7 onwards. Illustrations should be in Chem Draw or as picture in MS word Version 6 onwards or as TIFF files. Alternatively, the manuscript, files and approval may be e-mailed to mssingh@bhu.ac.in. Manuscripts should be divided into: Title, Authors, Affiliations, Abstract, Keywords (atleast five), Introduction, Result and Discussion, Materials and Methods, Experimental Section, Conclusion, Acknowledgements, References, Tables, Figures, Schemes, Captions and Graphical Abstract (for list of contents). All text must be double spaced throughout on A-4 paper, types on one side, 12 point, Times New Roman font and pages numbered. Abbreviations should be defined the first time they are used. Authors are encouraged to suggest the names of reviewers but it is not necessary that their papers will be sent to their suggested reviewers. The corresponding authors full mailing address and email address should be provided for speedy communications. Edited by: Dr. Anshul Verma,	Dept. of Computer Science, BHU Varanasi.